Home | Competitions | WIN 1 of 10 Dessert Boxes From My Sweet Box for Mothers Day! 10 lucky winners will receive a delicious dessert box from My Sweet Box, including a decadent donut bouquet, valued at $65 each. My Sweet Box specialises in delivering a premium range of delectable treats including donuts, cronuts and scrolls, packaged in luxurious packaging and finished with unique touches including balloons, mini Nutella Jars, Nutella filled personalised syringes and mini or full-size bottles of liquor. They also offer a gluten free selection of donuts and muffins ensuring everyone can indulge in a My Sweet Box surprise. For My Sweet Box, their difference is in the details. Every donut, cronut and scroll is baked fresh daily, using premium products to ensure a truly mouth-watering experience each and every time. Orders are hand-packed with care into gorgeous boxes that can be completely customised from scratch and finished with a personalised message for a truly bespoke experience. Offering a wide variety of indulgent flavours, My Sweet Box donuts, cronuts and scrolls will entice any sweet-tooth. 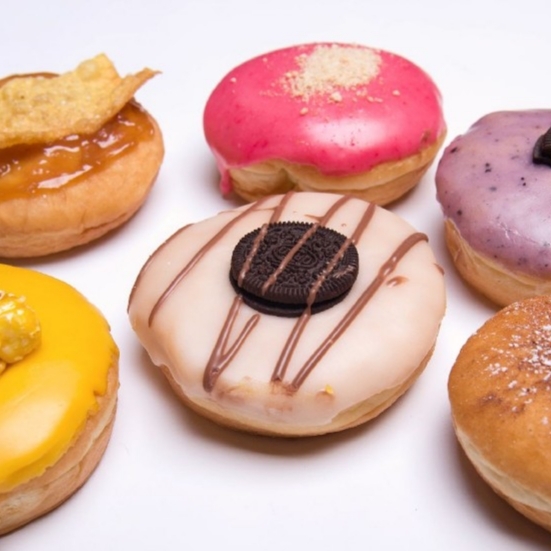 With options including Golden Gay Time filled donuts, Nutella Hazelnut cronuts, Salted Caramel with Butterscotch Popcorn topped donuts as well as 18 scroll flavours (such as Peanut Butter & Jam or Mocha) you’re literally spoilt for choice. Forget the roses, how about a bouquet of Nutella filled donuts? My Sweet Box also offer their unique bouquet arrangements, a cheeky play on the traditional floral gift that’s a whole lot sweeter! My Sweet Box currently delivers Sydney wide, with next day delivery guaranteed if orders are placed by 4pm the day prior. Visit www.mysweetbox.com.au for all the details and to order. Please note this competition is open from 11 April 2019 until 13 May 2019 and is only available to members of Mouths Of Mums. This competition is a game of skill – answer in 50 words or less. We are unable to accept entries posted via facebook. Facebook LIKE functionality is not a requirement of entry to this competition. The winners of this competition will be published on this page. Winners’ name and address will be provided to the promoter of this competition and prizes will be sent to the address you have in Your Profile. Please ensure your details are up to date so that you receive your prize. I would like the sweet treat box as it contains something for everyone in my family. Besides I could be sweet to my husband with a treat like this! Giant Nutella and Tim Tam box. 3 of my favourite food groups in a box that is delivered to my door. Yummy!! The mess I could make devouring this box. And something that would be special just for me. I would love to win the Mixed Bouquet as I don’t like my husband spending our hard earned money on bunches of flowers- but this is a bouquet I can totally get on board with! I would love the 6 gourmet box as it has a range of flavours I love. Sweet Treat Box – because its too Delicious for even my sweet tooth. My best friend is a chocoholic! She is a carer looking after her father 24/7. What keeps her going is her beloved chocolates. I’d love to surprise her with My Sweet Box – Sweet Treat Box. Simply chocolate treats. She is living proof Chocolate is good for you! As donut is life, I love em all. I’m a proud donut addict and will always find yummy donuts no matter where I go; domestically and internationally. The Lovers Box is beautiful!!! I am a lover of all thats in it!!! Any sweet selection of donuts would make our mouths water on Mothers Day! Delightfully indulgent for us dedicated darling mums to share! I would love to win the donut sweet box because I’m 3 weeks away from giving birth and have been craving donuts my entire pregnancy. I even made my husband drive all the way to Canberra to get some I saw on instagram!